Procrastination has very real—and very negative–consequences. You know that being 45 pounds overweight is having a negative impact on your health and your quality of life, yet you keep putting off learning to cook a few healthy meals and joining a gym. If you don’t hand in the budget report on time it will reflect negatively on your job performance and you’ll lose your chance to get a promotion at work, but you decide to watch “just one more” cat video on YouTube instead of getting to work. Your unpaid bills are piling up and you know you should create a second source of income so you can pay them off, but you decide to spring clean your house, go to the shelter to adopt a dog, or finish the novel lying on your bedside table instead of getting to work. If you’ve found yourself in any of the situations above, you may be asking yourself why you procrastinate. Is it poor time management? Were you cursed at birth by a wicked fairy godmother? Do you secretly hate yourself? Did you inherit some sort of procrastination gene? Are you lazy? Allow me to end the suspense: the reason you procrastinate is because of poor mood management. Aha! You feel like you’re not in the mood to carry out a particular task at the moment. You think that you’ll be in a mood that’s more conducive to taking on said task at a later moment in time. 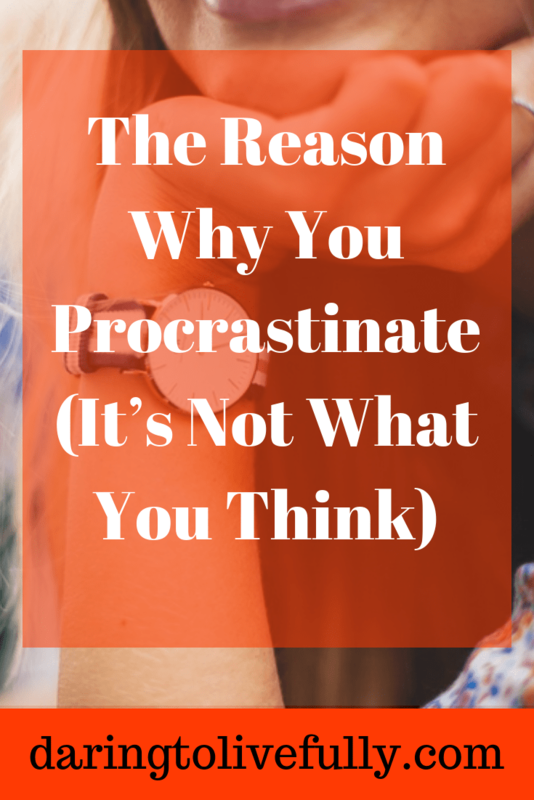 Now that you know why you procrastinate, what can you do to fix your procrastination problem? I’m going to give you some techniques you can use in this post. Below you’ll find seven ways to control your mood so that you can stop procrastinating and get started with those important projects and tasks that you keep putting off. If the mere thought of getting started on a task makes you wince—because it’s boring, difficult, or something you’ve never done before—it’s highly unlikely you’ll be in the mood to get started with it. Once you’ve framed something as “snooze-inducing”, the “task from hell”, or the “requires-genius-level-IQ” project, you can be sure you’ll be in full-on procrastination mode. How can I add an element of play to this? How does completing this task help me to achieve an important goal? How will I feel when this is done? What part of the task can I get started on right away? How have I completed a similar project? How will working on this project help me grow? Look for ways to see the task or project that you need to work on from a different perspective. You’ve heard politicians spin stories in a way that suits their narrative. Now you look for ways to spin the task that you need to get to work on so that it’s more appealing and, therefore, easier to get started on. A mature person knows that if something needs to be done, they’ll get to it, even if they don’t feel like it. I’m a runner, and a weightlifter. Both activities involve putting up with some discomfort, and there are days when I simply don’t feel like doing them. But I do them, regardless of whether I feel like it. My thoughts and emotions don’t make the final decision about what gets done. I do. And on those days when I feel down in the dumps, or a little voice in my head tells me to skip the gym, I override those thoughts and emotions, and I make myself exercise. I do it because I’m an adult, and I’m in charge. Look at the next action. By focusing only on the next action, you’ll calm your nerves. Then, you can deceive yourself. If I were to come up with a tentative title for a blog post, it would be something like. . .
I’m not going to get started on this right now, but if I were going to get started, I would. . .
I’m just going to open a Word document and maybe write the date at the top. I’ll just take out a pad of paper and a pen and place it here in front of me. Dr. Pychyl states that motivation follows action. Once you’ve deceived yourself into taking some action that’s related to the task that you need to work on, however small that action may be, it’s much easier to just keep going. Suppose you’re about to get started on a complicated task, and you feel some anxiety as a result. You know it’s going to take a lot of focused effort. To lessen this anxiety, you feel yourself clicking over to Twitter to see what your online friends are up to. That’s when you should stop yourself and time travel. In Scenario One you got started on the task right away. You felt some anxiety and discomfort at first, but you kept going. Then you realized that the task wasn’t that bad after all and you worked on it for an hour. In Scenario Two you clicked over to Twitter. You found a funny meme that was going around, and you got a good laugh out of it. Then you retweeted a few inspirational quotes, clicked over to read a couple of articles that looked interesting, and participated in a poll. Sixty minutes later, you realize that you’ve spent an hour on Twitter and haven’t even gotten started on the task. How do you feel when you think of Scenario One? You probably feel pretty good about yourself. How do you feel when you think of Scenario Two? Probably awful. In fact, the feeling of knowing that you just wasted an hour is probably worse than the anxiety that you feel when you think of getting started on the task at hand. A quick cost-benefit analysis will reveal that you’ll be much better off mood-wise if you get started on the task. The best way to beat procrastination is by turning whatever it is that you’re procrastinating on into a habit. Do you want to start exercising? Turn it into a habit. Do you want to “eat the frog” first thing in the morning? Turn it into a habit. Do you want to start meditating? Turn it into a habit. A trigger — the event that kicks off the urge to complete a habit. The routine, or the habit itself. Trigger: Putting your toothbrush away after brushing your teeth in the morning. Action – Walk to the living room, place a sofa cushion on the floor and sit on it, and meditate for five minutes. Reward – Have some flavored coffee. Since habits are something you do pretty much on automatic, whether you’re “in the mood” is a question you don’t even ask yourself. The trigger sets off the action, you perform the action, and then you reward yourself. There’s something important that they need to do, but they’re not in the mood to do it. They distract themselves from the task they don’t want to do by doing other things: going on social media; reading articles online that aren’t conducive to the achievement of their goals; engaging in busy work; and so on. They feel bad about themselves because they just wasted a bunch of time instead of getting to work on the important task. This makes their mood even worse, so they’re even less likely to get to work on the task. Get yourself out of this loop by showing yourself self-compassion. Once you realize that you’ve wasted 45 minutes, instead of berating yourself, forgive yourself. Accept that you messed up, acknowledge that you failed to self-regulate—which happens–, and resolve to do better moving forward. Then, give yourself a re-do. You didn’t get to work on the task 45 minutes ago like you should have, but you’re going to get started now. There’s nothing worse than trying to get yourself to work on a task when the reward for that task is far off in the future. The solution is to look for ways to reward yourself as soon as possible by breaking the task down into small parts and rewarding yourself after each of the parts is achieved. Let’s take a look at the task of writing a blog post as an illustration. My posts tend to be on the long side—this one is about 2000 words long—and I do a lot of research for them. This means that they take a long time to write. Often, when I’m about to start writing an article, I think to myself something like the following: “Oh, no. This is going to take forever.” That immediately makes me want to go do something else. Give myself a sudoku break (I love sudokus). Go to the kitchen and get myself a quick snack. Put on a song I love and sing along. Stop to acknowledge how much of the blog post I’ve completed. Put on a Shakira song and dance along (if you don’t listen to Shakira, you’re missing out). Encourage myself to keep going and knock off the few remaining tasks. Rewarding yourself is a great way to regulate your mood. I hope this post helps you to knock out an important task that you’ve been procrastinating on. If you need more help overcoming procrastination, get my eBook, “Make It Happen! A Workbook for Overcoming Procrastination and Getting the Right Things Done”. Live your best life by taking charge of your mood so you can overcome procrastination. Spend some time with yourself by setting up solo dates. You honor your commitments to yourself. You honor your own worth. You believe in yourself and what you’re capable of. You don’t allow others to disrespect you or treat you poorly. You’re a better significant other. Point out when you should go on a solo date. I don’t know if I’ve shared this with you before, but I finished college in three years instead of four, so I took a year off before gong to law school to travel. Specifically, I spent a year living and studying in Florence, Italy. One day while in Florence I saw that the opera Aida was going to be playing in the Arena di Verona—a Roman amphitheater in the city of Verona. Verona, of course, is the setting of Shakespeare’s Romeo and Juliet. It’s also just an hour-and-a-half away from Florence by train. I walked to Santa Maria Novella—Florence’s train station—and took a train to Verona. I arrived about an hour before the opera’s starting time and had a quick bite to eat at a café (coffee and panino). Then, I walked to the amphitheater, bought a ticket, and watched Aida. When the opera was over I followed the crowd back to the train station and returned to Florence. Wasn’t that a fantastic date?! I think so. Of course, solo dates don’t need to be as glamorous as this one. I’ve taken myself on lots of simple, but great nonetheless, solo dates. It has to be fun—do something that feels like play and makes you laugh. It has to be relaxing. It has to be interesting—you have to learn something new. It has to push you outside of your comfort zone. It has to give you an adrenaline rush. You can plan it ahead of time, or it can be a spur-of-the-moment kind of thing. You can dress up, or you can choose to go casual. It can be a stay-at-home solo date, or you can choose to go out. Your solo date can be during the day, or at night. It can last an hour, a day, a weekend. . . .you decide. Be fully present. If you’re out on a date with someone else, you don’t space out or stare at your phone all throughout date. You pay attention to the person you’re with. Show yourself the same courtesy: when you’re on a solo date give yourself and what you’re doing your full attention. Don’t be self-conscious—if you choose to go out on your solo date and feel that other people are looking down at you because you’re alone, just ignore them. Whoever judges you for being alone is probably just not comfortable being by themselves, and that’s too bad for them. Don’t overspend – stay within your budget. If you’re not enjoying yourself, go do something else. When you’re on a date with someone else and things aren’t going well, it can be tricky to put an end to the date. However, if you’re on a solo date and you find that you’re not having a good time, you can just go home without having to come up with a semi-plausible excuse for ending the date. Nice! I’m certainly not advocating that you become anti-social and stop dating other people (or going out with your friends). I’m just saying that there are times when self-dates are the way to go. So, why would you want to go on a solo date? First, there are times when you don’t have a significant other and your group of friends is busy with work, family, and so on. During those times you should still allow yourself to have fun, go out, and try new things. After all, your happiness shouldn’t depend on others. Second, even if you are in a relationship, or if your friends are available, there may be things you want to try that they’re not interested in. When that’s the case, there’s always the option of doing it by yourself. It’s not a good idea to allow others to dictate the experiences you get to have. Third, sometimes a person just wants some alone time. Compromising is generally a good thing, but there are times when you don’t want to compromise. Also, other people can be exhausting (wonderful, but exhausting), and sometimes you just need a break from everyone you know. Finally, alone time gives you the opportunity to reflect, re-center, recharge, and show yourself some love. You can reconnect with yourself, remind yourself of how great you are, and just care for yourself. If you find yourself in any of the situations described above, it’s time for you to go on a solo date. And in case you’re wondering what you should do on your solo date, below I’ll share with you 12 ideas for solo dates. There’s nothing better than walking at a leisurely pace around a bookstore, leafing through books that catch your eye, and then sitting down in a comfortable leather chair to read a few pages of those books that look promising. If the bookstore has a café attached, that’s even better. Once you’ve selected the book you want, you can make your purchase and head on over to the café. After ordering the warm beverage of your choice, you get to lose yourself in the book’s pages and spend an hour or two fighting racial injustice with Atticus Finch, walking the streets of 1960s Paris with Horacio Oliveira, or falling down a rabbit hole with Alice in Wonderland. Bliss! Another idea is to set up a standing book-and-a-coffee date with yourself by getting a Book Subscription Box. You can choose to receive a classic once a month, a mystery novel, a dystopian novel, or any genre you enjoy reading. Then, each month when you receive your subscription box, grab the goodies inside, sit in your reading nook (which I assume you have), and read away. Take a photography class with Annie Leibovitz. Steve Martin teaches a comedy course. You can improve your writing with Margaret Atwood (I love her). I’ve been toying with the idea of signing up, but haven’t taken the plunge yet. One of the classes that I’m really interested in is a cooking class with British cook Gordon Ramsay. In the class, Ramsay teaches you how to make several of the dishes he’s famous for, and one of those is lobster ravioli. Just think about it: you serve yourself a glass of your favorite wine, and then you spend the evening learning how to make lobster ravioli. The coup de grace is getting to eat the meal you’ve prepared. Of course, you don’t have to sign up for a Master Class to have a cooking solo date. You can get yourself a good cook book, find a recipe online that looks delicious, or ask a friend who knows their way around the kitchen to share a good recipe with you. I’ve written before on this blog about the importance of moving—movement is good for your mental, emotional, and physical health. A great idea for a date with someone else is to play a sport together, such as golf or tennis. You’re bonding and moving at the same time. 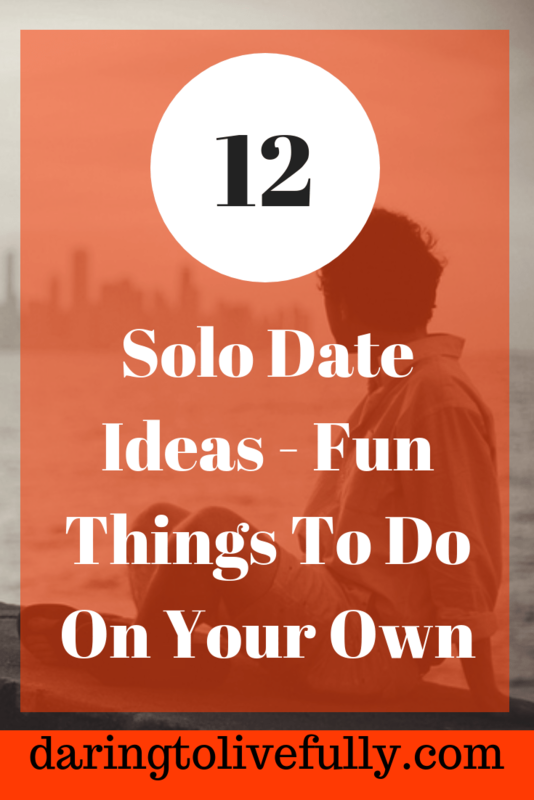 An active date is also a good idea for a solo date. One of the best activities you can do on your own is going for a bike ride. Go online and find a nice bike trail near your home, put on some comfortable workout clothes, grab your bike, head out to the great outdoors, and start pedaling. I spent a few years living in Costa Rica when I was growing up, and I remember that my mother had a close friend there who was going through a difficult divorce. Her kids were teenagers and on weekends they would go out and do their own thing, so she would often be left alone. Instead of sitting around the house wallowing in self-pity, about once a month she would go to a tour operator and spend the day exploring a new part of the country. Riding around in a tour bus, or taking a walking tour of a section of your city that you’ve never been to before, is a great self-date. Hanging out in an art museum for a couple of hours is an emotionally satisfying experience. Before going to the museum, visit their website and choose the area of the museum that interests you the most. Once you’re there, get an audio tour. With your headphones on it will be just you and the art work. When you’re done contemplating the works of art, have lunch at the museum café. I always feel so chic when I sit at a museum café alone (I don’t know why). Then, when you’re done having lunch, browse through the museum gift shop. Going home with a souvenir is optional, but highly recommended (even if it’s just a postcard of your favorite painting). Street combing is a creativity technique that Dutch innovation consultant Richard Stomp came up with. It involves choosing an interesting street in your city and walking down that street with a camera taking photos of anything that catches your interest. What is the concept behind this picture? Why did I take it? Take any ideas that you come up with after asking yourself these questions and apply them to solve any problems you may be having. Lots of people are familiar with the term “artist date”. It’s a term coined by Julia Cameron in her book, “The Artist’s Way”. An artist date consists of a block of time set aside once a week which is devoted to nurturing your creative consciousness. Go to an art supply store and see what catches your fancy. Get yourself a recorder and learn to play a simple song (there are lots of tutorials on YouTube). Go to a flea market and see what treasures you can find. Grab a sketchbook and head on over to the park. Just as one of the main purposes of going on a date with someone else is to get to know them better, you can use a solo date to get to know yourself better. What do you believe is possible for you? If you were told you will die in a week, what would you most regret not having done? What would a “perfect day” look like? What lies do you tell yourself? What do you need to feel safe? How happy are you, really? How do you think other people perceive you? Take out your bucket list. If you don’t have a bucket list, make one. Pick an item from your bucket list. Go do it (because, YOLO). Make some comfort food for yourself. Choose a film you really want to watch. Make your sofa as comfortable as you can: think cushions and soft blankets. Slip into the most comfy loungewear you own. Now turn on the film, eat your meal, and just sink into the sofa and relax. Get a jigsaw puzzle –choose a subject that you like (dogs, boats, castles, dragons, flowers, llamas. . .) and a level of difficulty that will be challenging but not overwhelming. Get a book of sudokus or KenKen. Get a book of chess puzzles, set out your chess board, and play the evening away. Are tacos at the very top of your favorite foods list? Have tacos for lunch. Do you consider eating ice cream to be heaven on earth? Stop by the ice cream parlor after lunch and get a cone of your favorite ice cream flavor. Is visiting the zoo one of your favorite things to do? Go! Catch a play, if that’s something you truly enjoy. Do you love sangria? Go home, whip up a batch of sangria, and serve yourself a glass. Cheers! Who else, but you, would be willing to devote a whole day to doing your favorite things? What a great date you are! So, where are you taking yourself on your next solo date? You can start small, if you’d like, and take yourself on more elaborate solo dates as you get the handg of it. Live your best life by taking yourself on solo dates. 12 Self-Awareness Exercises: Know Thyself! Smart is as smart does. However, other people would argue that being smart depends on the quantity and the quality of the education a person has acquired. Still others would say that smart people are those who are good at solving problems, or making money, or adapting to change. I would argue that—to a large extent—being smart is about what you know, and about your ability to apply said knowledge. And that’s what this post is about: I’ve collected some of the things—30 to be exact—that really smart people know. 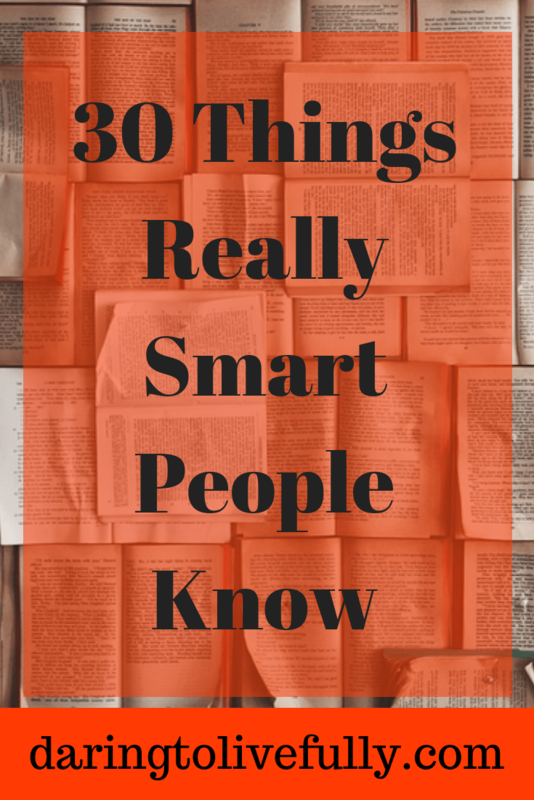 You’ll find the 30 things that really smart people know, below. 1. Discomfort Is a Part of Life. Achieving things that are important to you will require that you tolerate some discomfort, frustration, and psychological pain. For example, if you want to get in shape, you’ll have to exercise, which comes with its fair share of aches and pains. As a second illustration, if you want to learn something new, you’ll have to tolerate the discomfort that comes from not knowing, struggling to do something that is foreign to you, and feeling like you’re not making the progress you wish you were making. Smart people know that they need to tolerate discomfort in order to improve themselves and grow. 2. No One Is Coming to The Rescue. What happens in your life is up to you. You’re responsible for your life. If there’s something that you want to happen, you have to make it happen. No one is going to make things happen for you. You have to rescue yourself. 3. Stop Playing the Victim Role. You’re the hero of your story. The hero sometimes gets stuck in a bad place for a while, but they don’t wallow in self-pity and give away their power. Instead, they look for a way out: they crawl out through an air vent; they dig a tunnel; or they take an ax and break the door down. No matter what happens, it’s your life, and you’re at the helm. Author and motivational speaker Jim Rohn once famously quipped: “You are the average of the five people you spend the most time with.” Your friends will influence what you do and the habits that you develop. They’ll even impact your mood. Choose a few people who will help you to become the best version of yourself, and then carefully maintain those friendships. 5. Conformity is For Suckers. If you give in to society’s pressure to conform, you’ll never discover what you’re capable of. Think for yourself, make your own rules, step away from the well-trodden path, and do your own thing. 6. A Productive Day Starts the Night Before. What you do at night has a huge impact on how the next day will go. Smart people know this, and they take advantage of this knowledge by following a nighttime routine. Reflection – Reflect on your day. Think of what you did right, what went wrong, and how you can do better the next day. Planning – Write down the three most important things that you need to get done the next day. Organization – Set out the clothes that you’ll be wearing the next day, make sure that everything you need is by the door, and do all the prepping for breakfast that you can. Calming — include an activity in your nighttime ritual that will help you to relax (shut down your brain), such as drinking chamomile tea, doing some Tai Chi, or doing some breathwork. Lastly, make sure that you go to sleep at a reasonable hour so that you’re well-rested the next day. 7. Start Your Day Off Right. Drink water (preferably with lemon). Move your body – stretch or do some sort of exercise. Review your goals for the day. Say some affirmations, journal, watch a motivational video on YouTube, or do something else that will get you in the right frame of mind to face the day. In addition, once you’ve gone through your morning routine, devote one-hour to your most important goal. 8. You Have to Make Time to Exercise. Regular exercise improves memory and thinking skills, it boosts your mood, it helps to ward off disease, and it increases longevity. It even makes you more productive. Smart people know that making time to exercise is a no-brainer. Also, I just recently started doing High Intensity Interval Training (HIIT), and I’m loving it. It only takes 20 minutes, and you get a lot of bang for your buck. 9. Financial Literacy Is Vital. Financial literacy is knowledge that allows an individual to make informed and effective decisions with their money. It’s about knowing how to budget, manage debt, pay for big ticket items, invest for the future, and be prepared for emergencies. Smart people know that in order to have financial security, they need to understand how money works. Smart people are readers. Successful CEOs, leaders, entrepreneurs, and politicians read frequently. Reading teaches you to focus, it keeps you informed, it stretches the mind, it exposes you to different perspectives, and it helps in the creation of new ideas. If you want to be smarter, go out and get yourself books written by smart people and read them. 11. Learn How to Learn. In order to keep up with the changes and advances in today’s fast-paced world, we need to have the ability to learn new things faster. Some even refer to the ability to learn quickly and efficiently as a superpower. You can get started learning how to learn by reading my post, 30 Tips for Learning Any Skill Fast. 12. Constantly Stretch Out of Your Comfort Zone. As Neale Donald Walsh once said, “Life begins outside of your comfort zone.” After all, the only way to grow, build your capabilities, and reach your full potential is by stepping outside of your comfort zone. Some easy ways to stretch out of your comfort zone include the following: trying a new sport; having lunch in a new setting; or trying psychogeography dérive– an exploration of urban environments that emphasizes playfulness and “drifting” (basically it’s going for a walk and just allowing yourself to get “lost”). 13. Learn From Your Mistakes. Instead of being afraid of making mistakes, take a trial and error approach to life. Try something new, analyze what you did right and what you did wrong, modify your approach accordingly, and try again. That is, see your mistakes not as failures, but as feedback. Smart people know that it’s OK to make mistakes, as long as you’re learning from those mistakes. 14. Beware of Irrational Thinking. Catastrophic Thoughts: Here’s an example: “My boyfriend left me, so I’m going to die alone”. The reality is that the fact that one man doesn’t want to be with you doesn’t mean that no man will ever want to be with you. Personalization: As an illustration: “My boss is upset. I must have done something wrong.” The reality is that there are millions of reasons why your boss could be upset, none of which have anything to do with you. All-or-Nothing Thinking: An example of this type of thinking is the following: “I had set the goal of exercising three times a week, but this week I only exercised once. I might as well just give up on this goal.” The reality is that you just fell off the wagon this week, but you can always get back on next week. Smart people are aware of their thoughts, and they constantly question whether what they’re thinking is based on evidence, or if they’re distorting reality. Showing yourself self-compassion and self-love. 16. Carefully Curate Your Life. I wrote above that you should curate your friends. However, it’s not just your friends who need to be carefully curated. Smart people curate everything in their lives: the books they read, the stuff they buy, the furniture in their home, their clothes and shoes, the TV shows they watch, and so on. Smart people make sure that anything that comes into their lives has been carefully selected by them. You’ve heard it a million times: first you make your habits, and then your habits make you. Ask yourself: “What do I want to achieve?” Then ask: “What habit will get me there?” If you manage to build those habits, then those habits will take you to where you want to go. 18. Take Time to Think. How do I want to feel today? What do I need to do to feel that way? What do I want my day to look like? How can I best use my scarce resources today (time, money, attention) to achieve what I want? What projects am I working on? Do these projects reflect who I am or who I want to become? Am I on track to achieve these projects? What do I need to do to move these projects forward? Am I happy with my life? How am I doing in each life area (health, relationships, finances, and so on)? Where do I need a life reboot? If I keep moving in the direction I’m currently moving in, where will I be in five years? Smart people know that they need to stop and take time to think. Can’t find a publisher for your novel? Self-publish it. Can’t get a promotion at work? Start your own company and make yourself the CEO. Can’t get any store to carry your handmade bracelets? Start an Etsy shop. If you keep raising your hand and no one calls on you, call on yourself. 20. Ask the Right Questions. How could they have done this to me? Why didn’t I get it (the promotion, the deal, the grant. . . )? What can I do now to move forward? Is there something I can do to get a better outcome? What lessons can I learn from this that will help me do better in the future? 21. Make Meditation a Daily Habit. To treat a wide range of stress-related symptoms including anxiety, depression, anger, and insomnia. To improve your focus and concentration. To improve your emotional stability and your relationships with others. To be happier. Unhappiness has been linked to a mind that’s constantly wandering. Meditation helps to cure you of wandering mind syndrome by increasing your mindfulness. Smart people know that meditating is one of the best habits that they can adopt. Shift your focus from a state of lack to a state of abundance. Increase your happiness set point by 25%. Smart people are grateful people. Take the initiative instead of passively waiting for what you want to come to you. Put yourself out there: write articles on your subject of expertise; showcase your talent on YouTube; create an online portfolio; etc. Craft a compelling story for yourself. And, of course, be prepared. After all: “Readiness is the mother of luck”. 24. Know When to Say “No”. Causes you’re not deeply committed to. Networking events that will have a negligible impact on your career or sales prospects. Taking on more work than you can handle. Doing work that other people should be doing. Follow Baltasar Gracian’s advice in The Art of Worldly Wisdom: “Don’t belong so much to others that you stop belonging to yourself. 25. Include Play and Laughter in Your Life. Many people think that play is for kids, and that adults should be serious all the time. But smart people know that it’s important for adults to play and have fun. Relieve stress – play releases endorphins. Strengthen relationships – play is a way to bond with others. Stimulate creativity– play can encourage you to take risks, look at things from a different perspective, and notice new connections. It provides novelty and pleasure. It makes you more productive and helps you to overcome procrastination – it’s easier to get to work on a difficult task when you know you’ll get to do something fun later on in the day. Smart people schedule play and fun into their day. 26. You Must Bounce Back Quickly from the Unexpected. Smart people know that the unexpected will happen, and—when it does—they don’t waste time bemoaning their luck. Instead, they bounce back quickly from the unexpected. 27. Let Go of the Need for Perfection. Perfectionism steals your joy, your self-confidence, and your ability to get things done. Smart people know that the main causes of perfectionism are all-or-nothing thinking and fear of criticism, rejection, and disapproval. They develop strategies for dealing with any perfectionist tendencies they may have, and they strive for excellence, not perfection. 28. Stop Worrying About What Others Think. Humans are social creatures. We want to be part of a group. We want to be loved and accepted. And there’s nothing wrong with that. They work on trusting themselves more. They put things in perspective by reminding themselves that one day they’ll die. After all, the last thing that they want is to be lying on their death beds regretting all the things they didn’t do because they were worried about the opinion of others. They learn to be more selective about whose opinion really matters to them. 29. Conscientiousness Is a Vital Character Trait. Some character traits are more conducive to success than others. There are studies that show that the most important personality trait for predicting success is conscientiousness. Therefore, smart people take steps to become more conscientious. They have a set date, time, and place to pay their bills to make sure that everything is paid on time. They plan their meals each week, go grocery shopping, and prep their meals ahead of time so that they can eat healthy, home-cooked meals. They organize their work space at the end of each work day to make sure they’ll be able to find everything they need the next day. Smart people know that even if they’re not naturally conscientious, they can become more conscientious by adopting the habits of conscientious people. 30. You Must Not Quit. I persist when things get tough. Every problem has a solution, and I have the perfect ability to find it. Every day I gain more knowledge and insight about what works and what doesn’t, which means I’m getting stronger and wiser. I will find a way through this. Think! What’s the best thing to do now? There are many more things smart people know, of course, but I think the list above is a good starting point. Live your best life by reviewing the lessons that really smart people know (and apply them in your life). 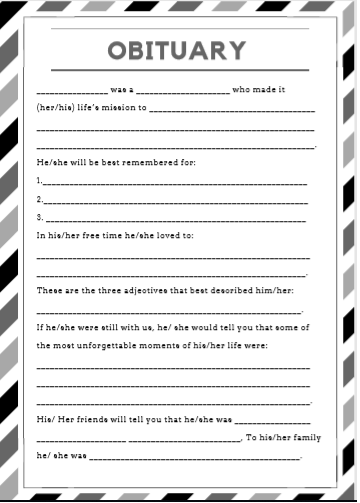 Why should you write your own obituary? Because it can give you a second chance at life. Dr. Alfred Nobel–a Swedish engineer and inventor–was having breakfast one morning as he perused the newspaper. He turned the page and discovered, to his shock, that they had printed his obituary. It turns out that his brother had died, and the newspaper had published Alfred’s obituary by mistake. The obituary read, “The merchant of death is dead”. This was in reference to the fact that Nobel was the inventor of dynamite. Although Nobel had created dynamite for the construction industry, it was being used as a weapon of war. Needless to say, Nobel was taken aback by the way in which he would be remembered after his death. It’s believed that it was due to this shock that Nobel decided to set aside the bulk of his estate in order to establish the Nobel Foundation. This foundation annually bestows international awards in recognition of cultural and scientific advances. Today, Nobel is not remembered as the merchant of death. Instead, he’s remembered as the creator of the Nobel Prizes, and as a great humanitarian. Having read his obituary while he was still alive gave him the opportunity to change his legacy. Although it sounds a bit macabre, writing your own obituary—or asking a friend or a family member to do it for you—can be an excellent wake-up call that can help you make important changes in your life. It can give you a second chance at life. There’s more on this below. Yesterday I was watching a re-run of one of my favorite television shows: “Frasier”. It stars Kelsey Grammer as Seattle radio psychiatrist Dr. Frasier Crane. One day, Frasier hurts his nose in a minor car accident and goes to the hospital to get it looked at. However, he gets tired of waiting and leaves before he’s treated. When Frasier’s turn comes and the nurse calls out his name, another man pretends to be Frasier so he can cut to the front of the line. This man suddenly dies of a heart attack in the hospital, and the evening news reports that Frasier Crane had died. The next day, Frasier has an experience very similar to the one that Alfred Nobel went through: the newspaper mistakenly published his obituary. This makes Frasier reflect on his life and everything that he has yet to achieve. Roz: Well, there’s something for your scrapbook, huh? Your own obituary. Frasier: Yes, well. You know, frankly, still it’s a little upsetting. . . it’s just, seeing all my life in black and white, it just all looks a little incomplete. Roz: What do you mean? Roz: Well, what’s stopping you? You’re not actually dead. Frasier: I guess you’re right. I’m not dead, am I? You know, maybe that’s a good way of looking at this actually, more of a wake-up call. In addition, he included in his aspire-to-obituary that he had started a blog to teach children about psychiatry, that he had traveled to South America, that he had taken up rafting, and that he spoke Russian. As he contemplates what’s missing from his life, Frasier also decides to take a risk by grabbing a bottle of wine and heading over to knock on the door of an attractive woman who lives a few doors down from him. If I died today, would I die happy? Am I satisfied with the direction in which my life is headed? Am I happy with the legacy that I’m creating? Is there anything missing from my life? What will I be remembered for? What do I need to do in order for my obituary to be “complete”? Do I need to reinvent myself? What risks do I need to take? Have I allowed myself to become confined to my comfort zone? Is there any area of my life that needs a reboot? What goals have I been putting off that I need to get to work on right away? How can I start using one-hour-a-day to change the direction of my life? What does this exercise tell you? You’re not dead yet, so get out there and start making any changes that you need to so that you can “live up” to your fantasy obituary. Turn this into an opportunity to get a second chance at life. Leopold Bloom–the protagonist in James Joyce’s novel “Ulysses”–said the following: “Read your own obituary notice; they say you live longer. Gives you second wind. 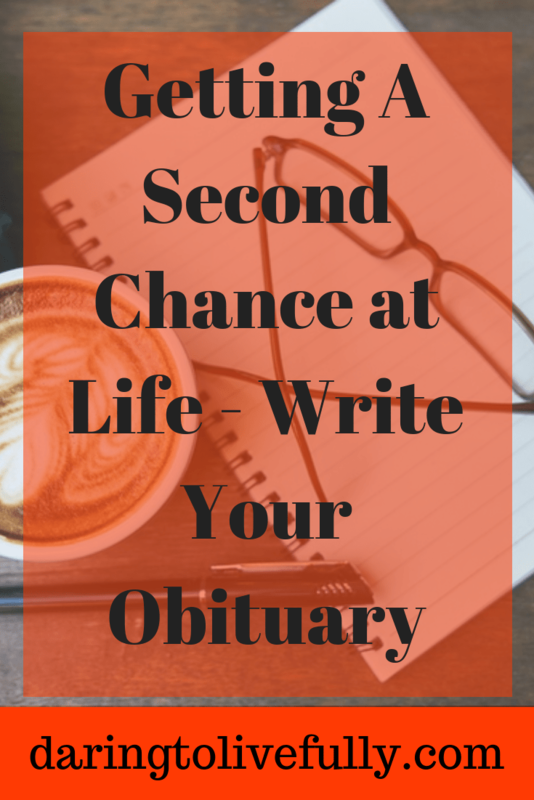 New lease of life.” Live your best life by writing your obituary. The key to making the best use of your time is to prioritize your tasks. Lots of people create to do lists; then, they get to work on the activities on the list in an indiscriminate order. As a result, they tend to be busy all day long but without achieving meaningful results. After all, not all tasks are created equal. This insight led him to come up with what is referred to as the Eisenhower Principle. He recognized that he needed to use his time in a way that was both efficient and effective. In addition, the way to do that was by not allowing the urgent to get in the way of what was most important. In this post I’m going to explain what the Eisenhower Matrix is, and I’m going to give you strategies on how to start applying it in your own life in order to make the best use of your time. Urgent activities are those that have a looming deadline. One way to decide if a task is urgent is to ask yourself: “When is the deadline for this task?” As I explain further down below, just because something is urgent doesn’t necessarily mean you should do it. You’ll find an explanation of each of these categories below. The first category of the Eisenhower Matrix–important and urgent–consists of firefighting. It’s where a lot of people spend most of their time. There will be a negative consequence–for example, your boss will yell at you for not handing in the financial report on time. You’ll miss an important opportunity–as an illustration, if you fail to deliver the grant application on time, you won’t be able to compete for the grant prize. If many of the tasks on your to do list fall into this category, you’re constantly in troubleshooting mode. This can be very stressful, and it will interfere with your ability to work on your long-term goals. You procrastinated on an important project or task. It’s Tuesday, you have a test on Friday, but you haven’t even started studying. It rained heavily and now your basement is flooded. You have to give a presentation to the board of directors in two days, but you haven’t gathered all of the necessary data. You get a call from your kid’s school saying that he’s sick and you need to go pick him up. Learn project management so that you can complete your projects in an efficient and timely manner. Practice prevention: exercise; eat healthy meals; follow a schedule of regular maintenance for your car and important household appliances; and so on. Set yearly, monthly, and weekly goals. Plan each day the night before. Then, every morning, review your plan. Take steps to overcome procrastination. This is the category where your values and your dreams live. Unfortunately, it’s often neglected because you allow tasks that fall into the other three categories to eat away at your time. 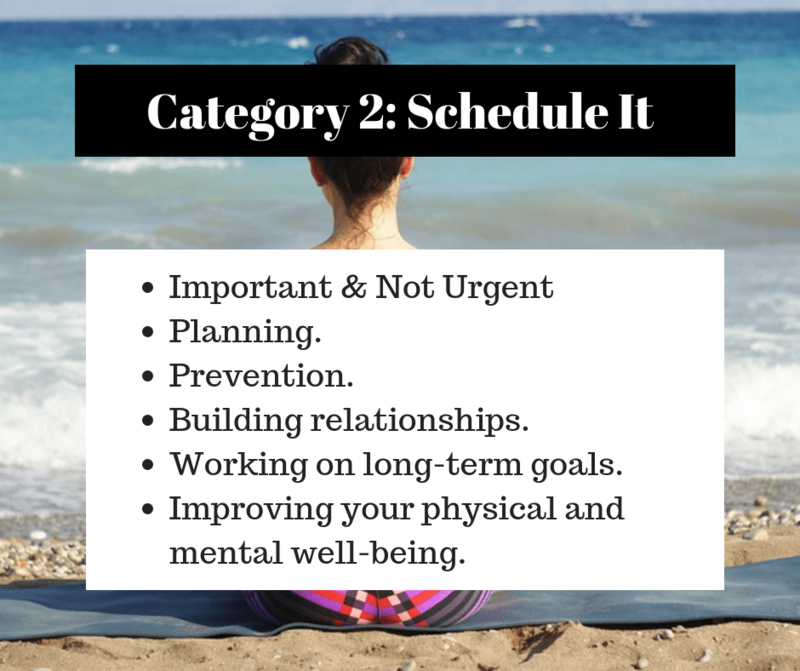 When you’re prioritizing your to do list, make sure to schedule a time and place for Category 2 activities. Then, make an unbreakable commitment to yourself to work on these tasks, even if they don’t come with a sense of urgency. This category is where the magic happens. 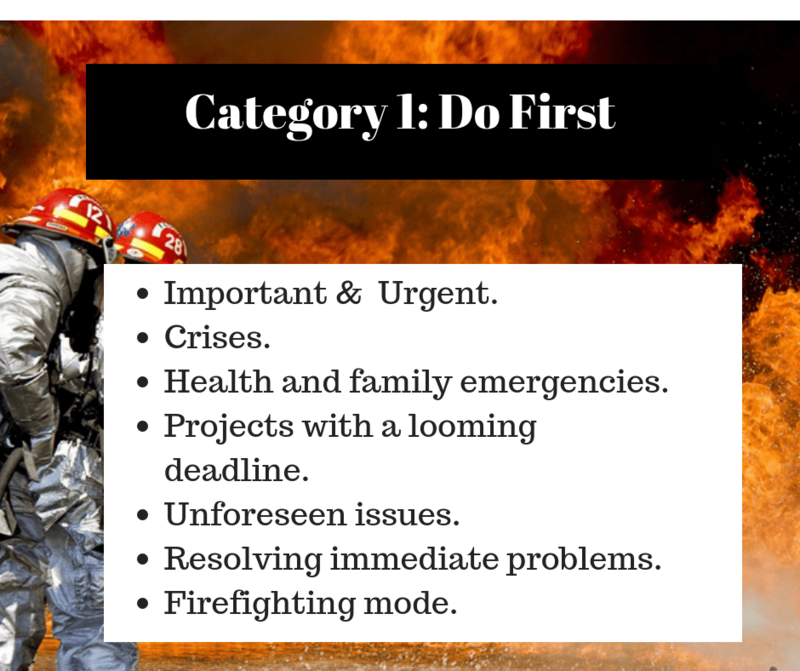 Tasks that fall into this category are those that will allow you to achieve your long-term goals in all life areas, as well as prevent fires that you then have to put out in Category 1. In addition, it’s a pretty stress-free category. Personal development–reading books on personal development, attending seminars, and taking online courses. Learning new skills–learning to code, learning another language, or acquiring business skills. Meditating, doing yoga, or doing Tai Chi. Spending time with your kids. Going on dates with your spouse. Creating a crisis management protocol for your business. Working on a rewarding hobby. Creating a second source of income. Taking steps to prevent the crises that put you in Category 1. Working on an important project in a timely manner. If this category is so great, why don’t people spend most of their time here? Because these activities tend to be pushed to the side by tasks and activities that fall into the other three categories. In addition, the consequences of not doing Category 2 activities don’t appear right away. Set goals–set short-term, mid-term, and long-term goals. Be clear on your values. Set aside one-hour-a-day to work on your most important goals. Create fake deadlines for Category 2 activities and look for ways to hold yourself accountable to those deadlines. 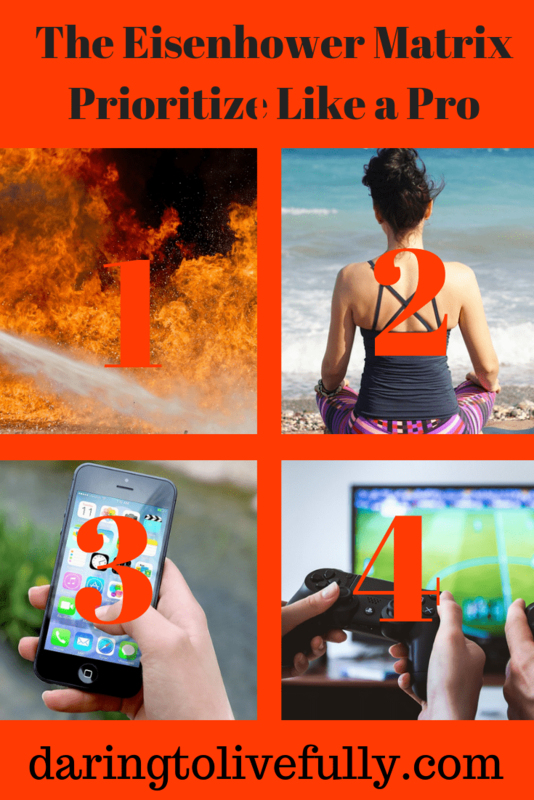 Follow the advice contained in this article for reducing the amount of time that you spend on activities that fall into Categories 1, 3, and 5. Apply that freed up time to Category 2 tasks. Tasks that fall into Category 3 of the Eisenhower Matrix can be very seductive, because they usually come with bells and whistles. The urgency of these tasks can make them feel important, even if they’re not. To stop feeling this way, look for ways to limit the tasks that fall into this category as much as you can. Interruptions, such as the doorbell ringing or a notification popping up on your computer screen. Some phone calls and meetings. The best way to deal with these activities is to postpone them, delegate them, outsource them, eliminate them, or give them a chunk of time and try to finish them as quickly as you can. Set your own agenda and your own priorities so that you’re not constantly working on the agenda and priorities of others. Learn to say “no” politely but firmly. Delegate and outsource tasks that fall into this category. Create systems to deal with tasks such as house cleaning and doing the laundry as efficiently and quickly as possible. Find a quiet space to work where you won’t be interrupted and turn off all distractions. Tasks that fall into this category are simply a waste of time and should be avoided at all costs. Lack of concentration–e.g., you lose your focus and find yourself reading articles on topics that are not related to the task you were working on. Low levels of dopamine–if your levels of dopamine are low you may find yourself engaging in what you perceive to be pleasurable activities to try to raise your levels of this important neurotransmitter. To avoid the discomfort of working on difficult tasks. Negative habits — for example, you may have created a habit of clicking on the Instagram icon every so often, and now you do it on autopilot. Burnout–you’re too stressed and tired to work on important things that require lots of brain power. Busywork, such as excessive formatting and creating unnecessary reports. Going on social media countless times throughout the day. Avoiding difficult tasks by aimlessly searching the web, mindlessly watching TV, playing video games for hours on end, or organizing your desk for the umpteenth time. Gossiping around the water cooler. Checking the news repeatedly throughout the day. Designate a time for checking email and social media. If you feel the need to go on Twitter or open your inbox, remind yourself that you’ve set time aside for that later. Block out chunks of time for important tasks. When it’s time to work on those tasks you only have two options: work on the task or stare at your thumbs. Schedule time for fun and relaxation so that you’re less tempted to escape by spending time on Category 4 activities. Make a list of the ways in which you waste time so that you can catch yourself when you’re engaging in any of these activities. 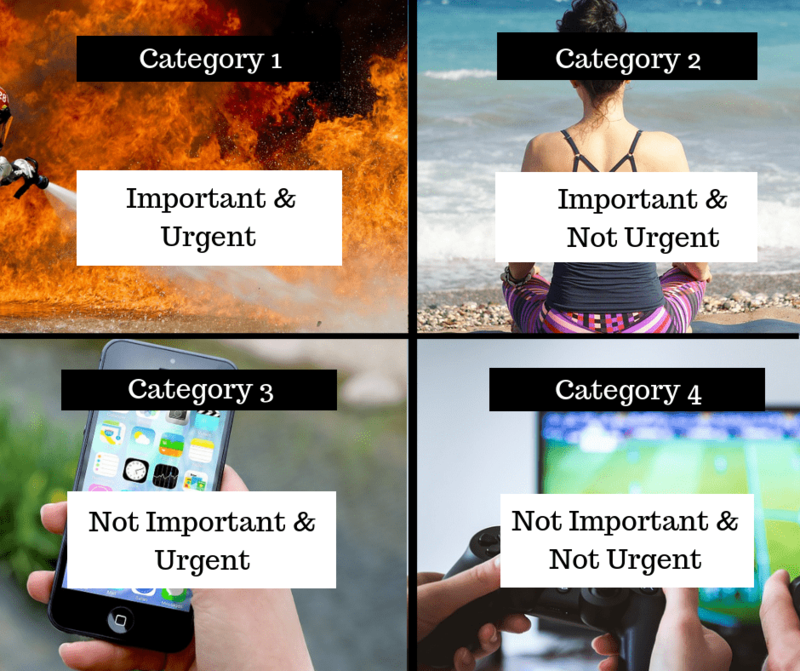 Create a clear structure for your day so that you don’t accidently wander into Category 4 (it happens). 1. Make a list of all the tasks that you have to complete throughout the day. 3. Depending on the answers to the two questions above, put each task in one of the four categories of the Eisenhower Matrix. You can download the PDF below and use that. 4. 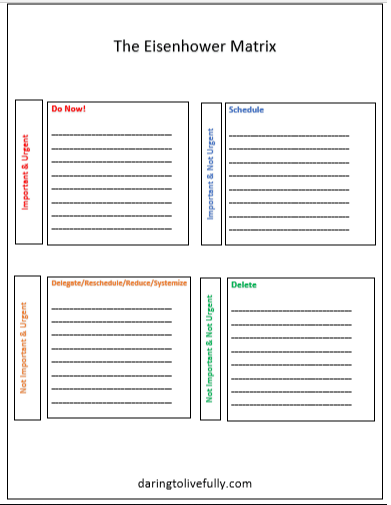 Take out your agenda, day book, calendar, or whatever you use to organize your day. Schedule tasks that fall into Category 2. 5. 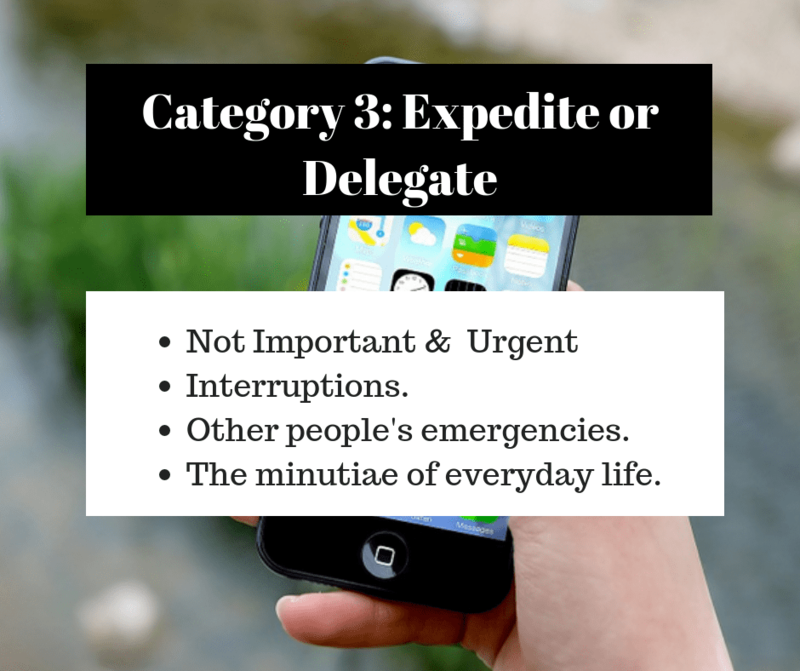 Eliminate, postpone, or delegate any tasks that fall into Category 3. If you have to deal with these tasks, schedule a time to work on them as expeditiously as possible. 6. Delete all Category 4 tasks. 7- Now that your day is planned, get going. Eat the frog and get to work on Category 1 activities — start with the most urgent one. 8. 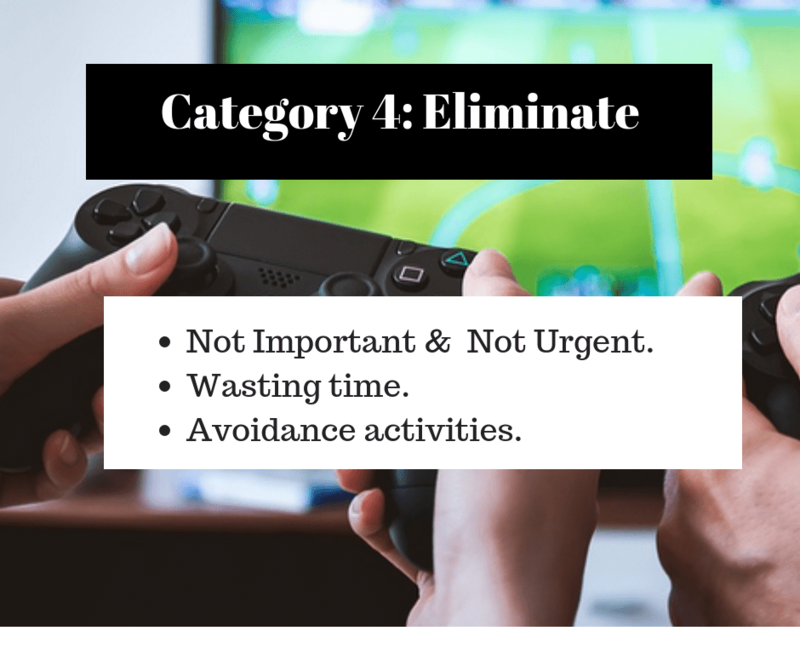 Devise a strategy for spending as much time as possible on Category 2 activities by following the recommendations found in this article. 9. Apply the strategy that you come up with. 10 Reevaluate in a month’s time. Organize your life in a way that will allow you to spend most of your time working on those things which are conducive to the achievement of your goals. The matrix created by President Eisenhower is a great tool for doing this. 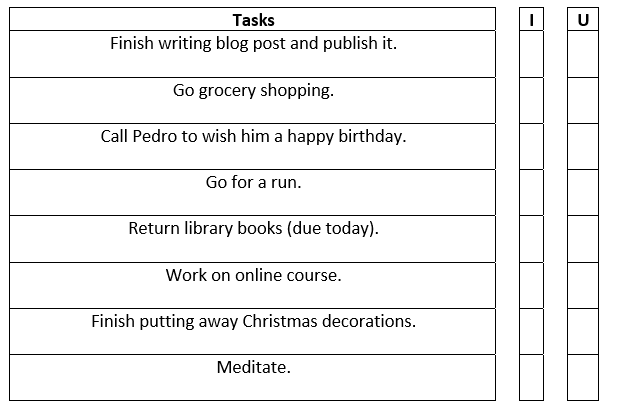 Live your best life by prioritizing your tasks with the Eisenhower Matrix. This year, take a 12 x 12 Challenge. And this year it will be no different. My recommendation for 2019 is that you try a 12 x 12 Challenge. 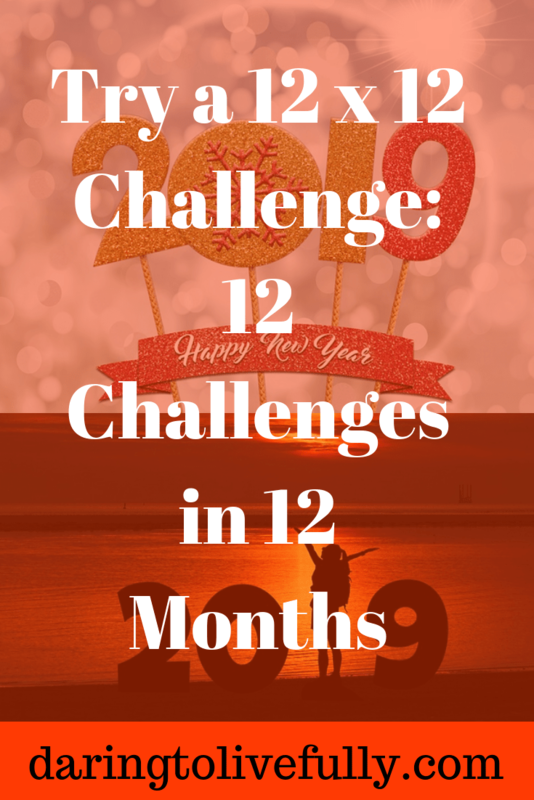 A 12 x 12 Challenge is simply 12 mini-resolutions, one for each of the 12 months of the year. The 12 mini-resolutions can lead to the completion of one large resolution by the end of the year, but not necessarily. I’ve designed several 12 x 12 Challenges for you to choose from, and you’ll get a better idea of what I’m talking about when you look through the challenges I’ve prepared. Of course, you can also use these challenges as inspiration to create your own. You’ll find the 12 x 12 Challenges below. (At the end of the post there’s a 12 x 12 Challenge Sheet you can download to create your own 12 x 12 Challenge for 2019). A popular New Year’s resolutions is to read more. If this is one of your resolutions, you can achieve it by taking a 12 x 12 Reading Challenge. This challenge consists of reading one book a month, for a total of 12 books in a year. That’s doable. So, what should you read for your 12 x 12 Reading Challenge? You can choose to read 12 books in your area of expertise, or you can begin the journey of becoming an expert in a whole new area by reading the 12 most important books in that subject. I haven’t decided whether I’m going to take this challenge yet, but I am reading “A Tale of Two Cities” right now. (For anyone wondering, the two cities are London and Paris). Your challenge can consist of twelve skills that are not related to each other, like the challenge above. However, an even better idea is to choose 12 sub-skills that will allow you to carry out a more complex skill. If you take on this challenge, by the end of the year you’ll have 12 new weapons in your arsenal of skills. I think it’s safe to say we could all use more adventure in our lives. The good news is that adventures don’t have to be far away, expensive, dangerous, or complicated. Be more adventurous in 2019 by taking 12 microadventures. A microadventure is any adventure that’s short, close to home, cheap, and simple. Therefore, it’s achievable. The term was coined in the book Microadventures by British explorer Alastair Humphreys . January – Eat a food you’ve never tried before. February – Visit a nearby town–staying the weekend is optional. March – Try a different way of getting to work – walking, cycling, taking the bus, or even skating. April – Go geocaching – an outdoor recreational activity that involves hunting for hidden objects using GPS coordinates posted on a website. May – Sleep under the moon (it can even be in your own backyard). June – Swim in the wild – find a river or a lake, and jump in. July – Go to a beach you’ve never been to before (bonus points if you try a new water sport). August – Spend a day eating only what you catch or forage. September – Climb a hill and have a picnic when you get to the top. October – Get on the subway and go to the end of the line. November – Attend a festival or fair. December – Be a tourist in your own town – visit a place in your town you’ve never been to before, such as a historical site, museum, or gallery. You can even take a walking tour of your city. Don’t the microadventures above sound like fun? I think so! Create 12 picture books in 12 months. 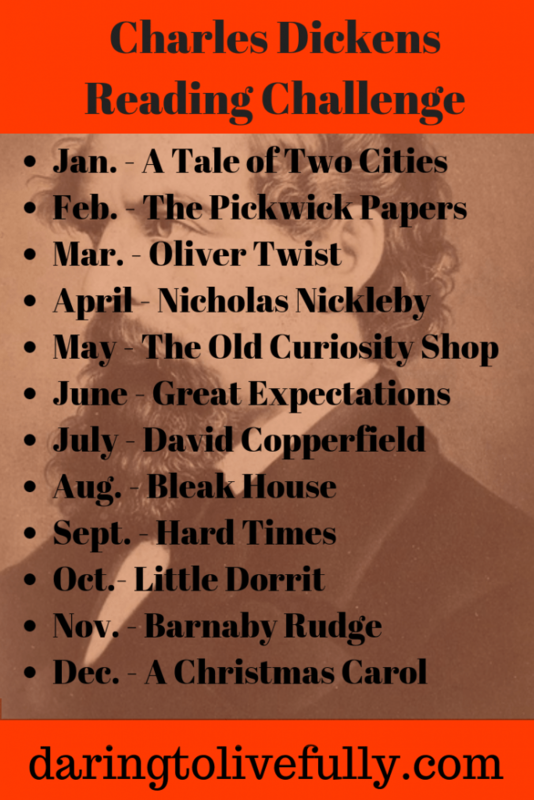 Write 12 short stories in 12 months. Complete 12 Lego challenges — adults can play with Legos. Paint 12 watercolors, one for each month of the year. Design 12 websites to add to your portfolio. This is another 12 x 12 Challenge I’m tempted to try this year. January – Turn a corner of a room into a small home office. February – Give your kitchen cabinets a new finish. March – Put up a bookshelf. April – Turn a closet into a mudroom. May – Turn a shabby cabinet into a bar cart (or a coffee cart). June – Build swings in the backyard. July – Build a chicken coop. August – Transform an old file cabinet into garage storage. September – Revamp your nightstands. October – Upcycle an item from a thrift store. November – Create a reading nook. December – Create art for your living room wall. Become a better person in 2019 by conducting lifestyle experiments. Twelve of them, to be more precise. Through experimentation you’ll be stepping out of your comfort zone and you’ll discover practices you can adopt to become a better version of yourself. January – Try daily brachial hanging (holding on to a horizontal bar and hanging relaxed with loose shoulders). February – Wake up at 4:30 a.m. for a month. March – Go vegan for a month. April – Go without social media for a month. May – Write 1000 words a day for 30 days. June – Try the Paleo diet for a month – a dietary plan based on foods similar to what early humans ate. July – Try a 30-day no spend challenge during which you don’t buy anything that isn’t necessary to live. August – Do one simple exercise–like walking for twenty minutes–every day for a month. September – Create something every day for a month. October – Don’t watch any television for a month (this includes watching shows on your computer). November – Don’t read or watch the news for 30 days. December – Do yoga every day for a month. Which of the 12 x 12 Challenges above peaked your interest? They all look good to me, and I’m going to have a hard time choosing one. But choose I must. Live your best life by taking a 12 x 12 Challenge. You can download the 12 x 12 Challenge Sheet which you can use to design your 12 x 12 Challenge, below. Stop caring what others think and get on with the business of living your life. The problem begins when a person’s need to belong interferes with their quality of life and their ability and/or willingness to go after their goals and dreams. When this happens, the person needs to learn how to stop caring so much about what others think. You no longer constantly second-guess yourself. You get your mojo back—instead of walking in step with everyone else, you break from the herd and head off in your own direction. You’re willing to take more risks, learn new things, and seize more opportunities. You feel more self-acceptance and self-worth. You allow yourself to be who you are. Doesn’t that sound great? Yes, it does. 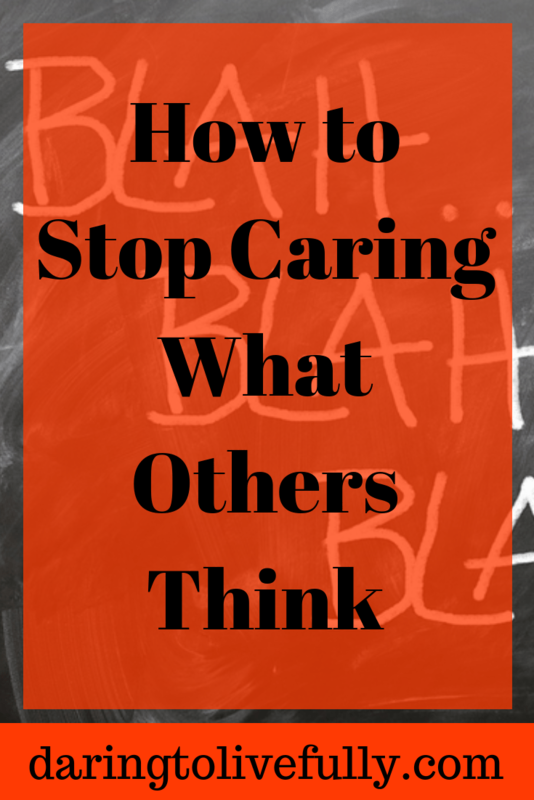 In this post you’ll find six ways to stop caring what others think. Who they hang out with. The shows they watch on TV. How they spend their leisure time. The opportunities they’re willing to consider. If you rely on the opinion of others to feel good about yourself, then of course you’re going to give a lot of importance to what others think of you. Therefore, if you want to stop caring what others think, you need to start relying on yourself for validation, instead of relying on the validation of others. That is, you need to trust yourself. Become more accepting of who you are. People who accept themselves are better at brushing off disapproval from others. Increase your self-esteem. The higher your self-esteem is, the more you’ll be willing to rely on your own opinion and make your own decisions. Love yourself more. I wrote a whole post on falling in love with yourself, because it’s such an important topic. When you truly love yourself you know that—no mater what—you’ll be there for yourself. And when you know that you’ve got your back, it makes it much easier to trust yourself. Be your own biggest fan, instead of your biggest critic. Send the inner critic in your head packing and give your inner cheerleader a megaphone. This is your one life. This is it! There are no do-overs. Instead of worrying about what others may be thinking or saying about you, give them something to talk about. Do you want to be lying on your death bed filled with regrets because you were worrying about what others might be thinking of you instead of getting out there and trying new things? Life’s too short to worry about what other people think. I’ve written posts on this blog on leading a meaningful life, starting a passion project, and leaving a legacy. That is, I’ve recommended repeatedly that you aspire to make your life remarkable. If you have trouble getting yourself to stop caring what others think, you should re-read these posts (or read them for the first time if you haven’t read them yet). Why? Because if you’re busy working toward something that’s important and meaningful to you, you simply don’t have the time and/or the brain bandwidth to worry about what others think. As an illustration, the other day I was sitting at a table at a club that I belong to reading a book for a blog post I was writing. A woman walked by my table and I glanced up at her. She gave me a disapproving look. I immediately stopped thinking about the woman and got back to work. As a second illustration, a few weeks ago a man was smoking in an area that was clearly marked as non-smoking. I politely asked him to stop, but he wouldn’t. That’s when I called security. The man looked pretty upset that I called security on him, and for a minute I second-guessed my actions. But then I told myself that I was protecting my health, and that I had every right to do so. As you can see from these two examples, my work and my health are very important to me. They’re much more important to me than the opinion of others. What’s more important to me, living a full and authentic life, or the opinion of others? What’s more important to me, knowing that I’m trying to learn new things and improve myself, or the opinion of others? What’s more important to me, doing what I think is right, or the opinion of others? You get where I’m going with this. Stop caring what others think by having more important things to care about. A while ago I wrote a post on how to live a well-curated life. Living a well-curated life means that you don’t just allow things to come into your life haphazardly. Instead, you choose carefully who and what merits admission into your life. Follow this same principle of living a well-curated life when it comes to the opinion of others. Don’t worry about just anyone’s opinion. Instead, be very selective about whose opinion you care about. Is this someone I hold in high regard? Do I feel this person has my best interests at heart? Are they giving me their opinion in an area in which they’re knowledgeable? If the answer to any of the questions above is “no”, then you shouldn’t care what that person thinks. If the answer to all three of these questions is “yes”, then you should take that person’s opinion into consideration. Nonetheless, always keep in mind that–at the end of the day–, the opinion that matters most when it comes to you is your own. After all, no one knows you as well as you know yourself. Instead of buying the beige or the black shirt because those are the colors you and your friends usually wear, buy the bright red one that you really want and wear it with confidence. If you’ve been hesitating about putting your drawings—or anything else you’ve created– online because of what people might think, take the plunge. Start a blog and put your stuff out there. Have the gumption to get out there and give rollerblading a try, or take that public speaking class, or try out for the play, or do anything else that you’ve been too scared to try because of what others might think. If you hear snickering and jeering, know that it’s people who are jealous that you’re out there trying something new, while they’re sitting on the sidelines watching you. When you first start trying to ignore what others think, it will be hard. But you’ll get better at it, and your “I don’t care what others think” muscles will get stronger. Soon you’ll be living a happier and more fulfilling life because you stopped caring what others think. Stop thinking of criticism as something negative. Instead, take it as feedback and an opportunity for growth and improvement. When companies put a new product out, they don’t expect everyone to come back with raving reviews. They know that consumers will uncover some glitches in the product and will report them, or that they’ll identify additional features that they want in the product. The company then takes this feedback and uses it to make the next version of the product better than the first. Take the same approach. Put yourself out there. Then take any criticism that you get from others as feedback, sift out the useful criticism, and use it to make yourself even better. I used to be incredibly self-conscious and hyperaware of how I was being perceived by others. As a result, I was always stressed and unwilling to try new things. Fortunately, I got over it. And my life is so much better as a result. To live your best life, stop caring what others think. To get what you want, you have to ask for it. Do you ask for what you want? Most people don’t. They yearn, they hope, they hint, and they drop vague innuendos, but they don’t ask. If you’re in sales, you have to ask for the sale. If you go on a job interview, you have to ask for the job. If you want a raise at work, you have to ask for it. If you would like to get more acknowledgement from your loved ones for the things you do for them, you have to ask them for it. If there’s something that you really want to get as a gift from your spouse for your birthday, you have to ask them for it. If you need help, you have to ask for it. Whatever it is that you want to achieve in life, it’s almost certain that someone else has something that you need in order to achieve it, and you’re going to have to ask them for it. However, most people don’t know how to ask for what they want. 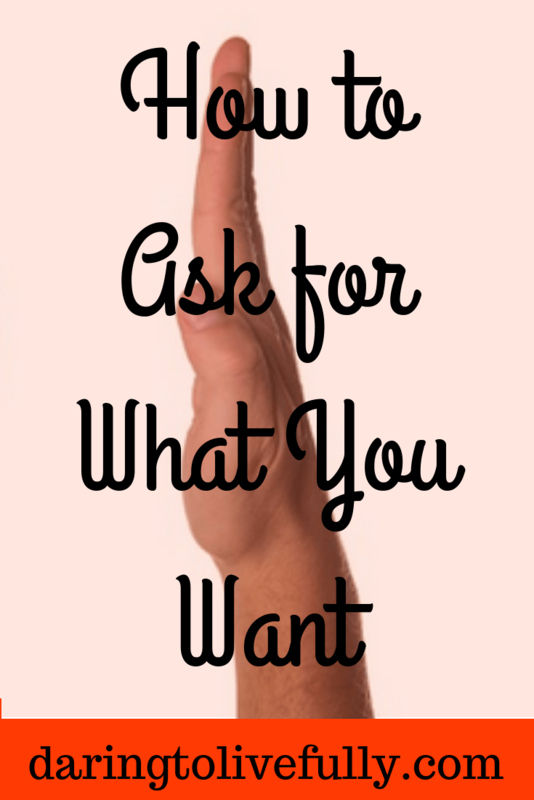 This blog post will show you how to ask for what you want and increase your chances that you’ll get it. Jack Canfield and Mark Victor Hansen, co-authors of the bestselling “Chicken Soup for the Soul” series, wrote an entire book on the subject of asking for what you want. It’s aptly called “The Aladdin Factor”. Canfield and Hansen believe that most people fail to get what they want–despite reading lots of books on success and goal achievement–because they skip the crucial step of asking. You don’t know how to ask. 2. Limiting and inaccurate beliefs. Many people believe that they don’t have to ask for what they want. For example, you may think that if you work hard and get good results for your company, you’ll get a raise. Or you may think that if your significant other really loves you, they’ll be attuned to all your needs and will give you what you want. These beliefs are wrong. It’s rare that a boss will offer a raise to an employee who doesn’t ask for it. And it doesn’t matter how much your significant other loves you, he or she is not a mind-reader. If there’s something that you want from them, ask them for it. 3. Fear. Fear often stops us from asking for what we want. We’re afraid of rejection, of being ridiculed, and of looking stupid. 4. Low self-esteem. One of the reasons that people don’t ask for what they want is because they feel that they don’t deserve it. 5. Pride. There are some who feel that asking for help makes them look weak. They think that they should be able to figure everything out by themselves and find a way to get what they want on their own. Each of these points is explained below. You need to assess carefully who can give you what you need. For example, if you’re thinking of asking family members for financial help with a start-up, don’t ask your sister who is newly married and has just started a family. Even if she really wants to help you, unless she’s very wealthy, she’s just not in a position at the moment to give you financial help. In addition, don’t ask your tightfisted uncle who has never lent anyone a cent in his life. When you ask for something, make sure that you’re asking the right person. While it’s not a good idea to try to get what you want by making demands, when you ask for something you should appear confident. You can project confidence with your body language, your tone of voice, by making eye-contact, and by choosing the right words. “I was hoping I could receive a free press pass to the San Francisco Ad:tech conference. I am a web entrepreneur and blogger, and would be covering the event from my popular blog which has an RSS readership of over 1,400. “Hello this is [insert name] from [insert blog] and I need a press pass to cover Ad:Tech. I was notified by ValueClick and Google about your show. They said we should check it out. Who do you think got the press pass? The second one, even though his blog has a smaller audience. Ask as if you expect to get it. Confidence goes a long way. Take the time to prepare so that you’re very clear on exactly what it is that you want. Then express your want as plainly and as directly as possible. The clearer your request, the more likely it is that the other person will be able to meet it. For example, a lot of people email bloggers with a large subscriber base and ask them to link to their blog. That’s a really bad strategy. Why would a popular blogger link to your blog when there’s nothing in it for them? A much better strategy is to find large blogs that accept guest posts and write a fabulous post for them (make sure to follow their guest posting guidelines). That way, they get great content for their blog, and you get a supercharged link back to your blog. Have concrete evidence of the positive impact that you have on the corporation. Telling your boss, “I need more money because I’ve had some unforeseen expenses”, is not going to get you a raise. When and where should you approach the person you’re going to ask for what you want? What language should you use? What steps can you take to make it more likely that you’ll get what you’re asking for? My sister has two little boys. One of them is three-years-old. When the three-year-old wants something, he unabashedly asks for it. If you tell him “no”, he wants to know why not. If he can’t have it now, then he wants to know when he can have it. If he asks for ice cream and is told that he can’t have any, then he asks for chocolate milk. If he’s also refused the chocolate milk, then he moves on to orange juice. As you can easily guess, he always walks away with something. The same concept applies in sales. Salespeople know that they’re probably going to be turned down several times before they make the sale. Therefore, they listen to the customer’s concerns and then they try again by offering a different solution to the customer’s problem, or by addressing any fears they may have. In addition, this concept applies to all areas of life. When you ask, be ready to encounter some resistance. Then, instead of backing away, deal with that resistance. While you shouldn’t simply repeat your original request like a broken record if you’re rejected, instead of giving up, start looking for alternatives. “No” means “not now”, “not here”, “not yet”, or “you need to change your approach”. It could also mean that you’re asking the wrong person. Modify your approach, find the right person to ask, or wait for the right moment. But keep asking. As was stated earlier on in this post, one of the reasons that people don’t ask for what they want is because of fear. Maybe you want to ask your boss for a raise, turn a work colleague into a friend, or ask a couple of friends to look over your business opportunity. First, you have to be willing to be a little afraid. You don’t have to give in to the fear, but you have to be willing to feel it. Acknowledge that you are creating your fear, and you’ll start to triumph over it. If you ask, you might get a “yes”. But if you don’t ask, you’ll always get a “no”. To get what you want, you have to have the guts to ask for it. As you start asking others for what you want, remember that the flip side of getting is giving. If you’re going to ask someone for help, why not lend a hand to someone who approaches you asking for advice? If you want to ask your spouse to acknowledge all of the work that you do around the house, why not acknowledge them for going out to work each day so that you can stay home with the kids? If you’re going to ask others for what you need in order to accomplish your goals, why not share your resources with others so that they can achieve their goals? Just as others have things you want, you have things others want. If someone asks for something reasonable that you can give them, and they follow the guidelines above, why not give it to them? Get started asking for what you want right away. Just download the exercise I created for you below. I used to be scared of asking for things. But I’m not anymore. When I want something, I ask for it. Sometimes I get a “no”, but most of the time I’m given what I ask for. I attribute my high success rate to the fact that I follow the process I laid out above. 1. If you haven’t subscribed to my blog, do so now and you’ll be notified every time I publish an article with great tips on how to live your best life. 2. Get The One-Hour-A-Day Formula: How to Achieve Your Dreams in Just One-Hour-A-Day and move your most important goal forward in just one-hour-a-day. 3. If procrastination is the bane of your existence (as it used to be bane of mine), get Make It Happen! A Workbook For Overcoming Procrastination and Getting the Right Things Done and conquer procrastination once and for all. Live your best life by learning how to ask for what you want. Make your holiday season more festive and joyful by learning these five skills. I love learning new things, and I know that most of my readers do as well. Therefore, in this post I’m going to recommend five skills you can learn in just a few hours to make this holiday season merrier and brighter. For each skill that I recommend that you learn, I’m also going to link to a course that you can take to learn it. These courses are all on Udemy–one of the world’s largest online learning platforms. As an added incentive to learn these skills now, Udemy is having a sale through Cyber Monday. If you act fast, you can have these courses for $9.99 each. That’s five new skills under your belt for under 50 bucks. You’ll find the five courses which I recommend you take this holiday season below. Singing is something we can all do—albeit, some better than others—and it’s an activity that will make you happier. When you sing, your body releases the feel-good hormone endorphin. In addition, it releases oxytocin, which helps relieve stress and anxiety. The holidays are a great time to learn to sing since there are so many opportunities to try out your new-found skill: there’s a frenzy of gatherings during the month of December, and songs are ubiquitous in all of them. I, for one, celebrate Christmas, and I love Christmas carols. I already enrolled in Singing Simplified #1: The Fast-Track to Singing Like a Pro. I’m looking forward to applying what I learn in this course at my next family gathering. Photograph a winter landscape covered in new-fallen snow. Gather your family and friends together at a holiday event and take their picture. Cook a beautiful, delicious holiday meal and photograph it before digging in. Go look at the holiday store window displays and photograph the most creative ones. Do a great job decorating your home for the holidays and take a picture (share it on social media). Unfortunately, taking good photos is a lot more difficult than simply pulling out your camera; pointing at the object, person, or scene you want to photograph; and shooting. But the good news is that there are plenty of great photography lessons out there which will teach you the basics of photography quickly, so you can start taking photos you can be proud of this December (and in the year to come). Here’s the one I plan to take: Photography For Beginners Complete Guide: Master Photography. The holidays can be a stressful time—with all the cooking, gift buying, and decorating involved—but it doesn’t have to be. This year set the intention of having a peaceful holiday season. As I write in my blog post on 10 Ways to Have a Peaceful Christmas, try starting each morning with five minutes of quiet. It’s even better if you use those five minutes to meditate. If you don’t know how to meditate, you can learn to do so now. Here’s a course on Udemy that looks promising for those who want to learn how to meditate: Meditation Made Easy – The Step by Step Guide. If you don’t know how to cook, hopefully you’ve been invited to have your holiday meal with someone who does. But if this isn’t the case, try cooking your holiday meal yourself. How? By taking the course Thanksgiving Dinner in One Hour: Turkey, Sides, & Dessert. I’m thinking of calling my sister and asking her if she wants to try making this with me. This may sound like a strange choice but hear me out. 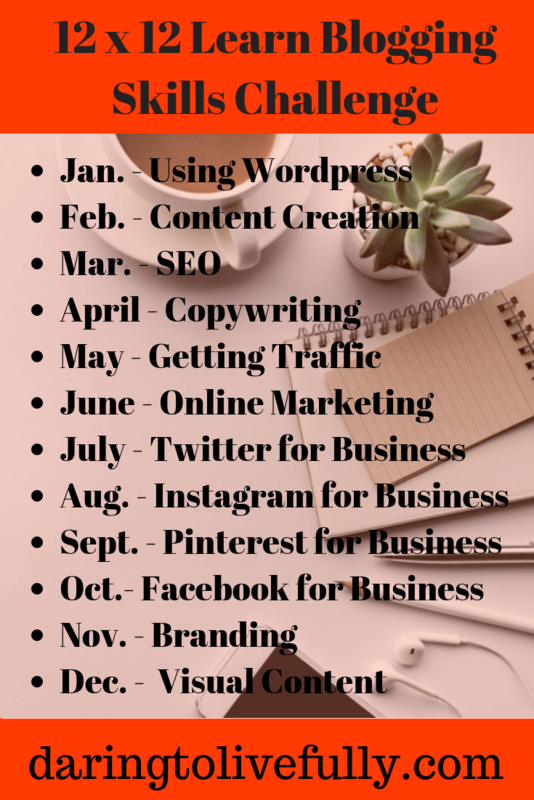 Last year I gave myself the challenge of creating a Udemy course. The course I created is called How to Create a Powerful Alter Ego (and why you should). Your alter ego can be more assertive than you are and help you to say “no” to all those holiday requests that you simply don’t have the time and energy for (or that you simply don’t want to do). You can choose to create an alter ego that is more outgoing than you are. That way, you can have a better time at the office holiday party and maybe even do some networking. If you’re not feeling particularly cheerful this holiday season, your alter ego can have a positive, cheerful, fun-loving, playful personality. There are countless ways you can use alter egos to make this holiday season the best one yet. 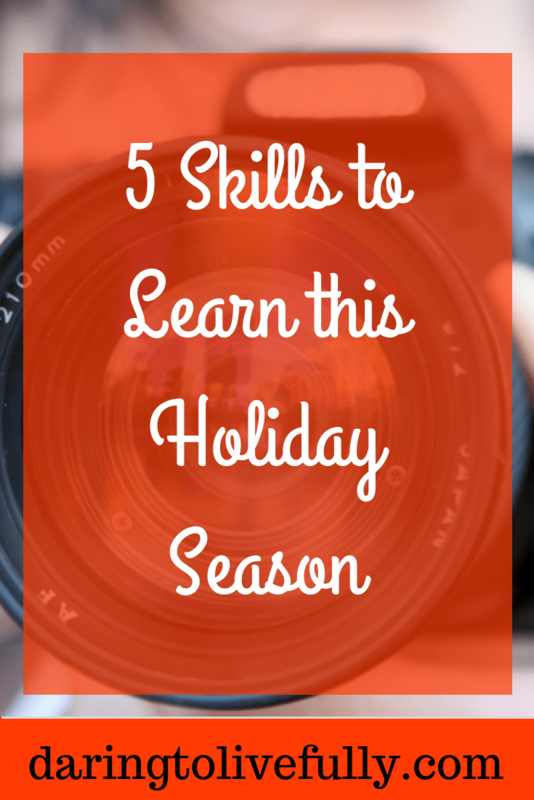 Learning the skills above will make your holiday season more joyous, festive, and fun. Which courses do you plan to take? Live your best life by learning new skills. Count your daily blessings and they will multiply. Every year at this time I publish a post about gratitude. I’ve shared with you gratitude exercises, gratitude quotes, and even prompts so that you can come up with a master list of 100 things you’re grateful for. After all, the purpose of this blog is to help you to become the best version of yourself, which includes increasing your feelings of happiness and well-being. And one of the best ways to feel happier and better about yourself–and your life–is through the miraculous power of gratitude. You’ve probably heard a thousand times that in order to enjoy the many benefits of gratitude, you should keep a gratitude journal. Then, every night, use your journal to jot down at least three things you’re grateful for on that day. Today’s post is going to help you with this. Below you’ll find a list of 55 gratitude questions you can quickly scan through each night to help trigger your memory, so you can come up with three items to write down in your gratitude journal. Think of them as questions that will help you to count your daily blessings. 1. What was the best part of the day? 2. When did I feel grateful today? 3. What made me smile today? 4. What made me laugh out loud today? 5. Who helped me today? 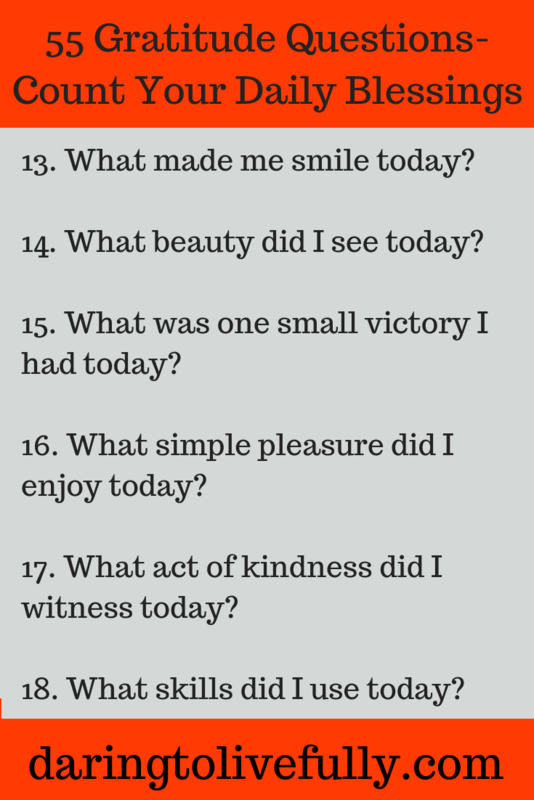 6. Who was kind to me today? 7. What insight did I gain today? 8. What did I learn today? 9. How am I better today than I was yesterday? 10. What did I read or listen to today that added value to my life? 11. How did technology make my life easier today? 12. What activity did I most enjoy today? 13. What was the most delicious thing I ate today? 14. What did I enjoy listening to today? 15. What made me think, “That smells good!” today? 16. What was pleasant to the touch today? 17. What beauty did I see today? 18. What was one small victory I had today? 19. What simple pleasure did I enjoy today? 20. What act of kindness did I witness today? 21. What did I create today? 22. What skills did I use today? 23. What strengths did I apply today? 24. What weakness was I able to keep in check today? 25. How was I able to help others today? 26. How did I move an important goal forward today? 27. How was my body an ally today? 28. Who was I happy to meet with, chat with, or run into today? 29. What compliment did I receive today? 30. How did I feel appreciated today? 31. Who showed me affection today? 32. What positive emotions did I experience today? 33. What negative thoughts, beliefs, or emotions was I able to release today? 34. What opportunity presented itself today? 35. What obstacle did I overcome today? 36. What problem was I able to resolve today? 37. What negative was I able to turn into a positive today? 38. What’s the silver lining to something that went wrong today? 39. What made me feel hopeful today? 40. How did I show gumption today? 41. How was I awesome today? 42. What positive habits did I engage in today? 43. What negative habits was I able to avoid today? 44. When did I feel love today? 45. When was I at peace today? 46. What did I do today that was fun? 47. What was something playful I did today? 48. How did I show myself compassion today? 49. What positive things did I notice about my surroundings today? 50. What made me appreciate my city, state (province), or country today? 51. When did I feel a sense of abundance today? 52. How did I feel connected to others today? 53. What is one positive thing I can say about today’s weather? 54. What made me feel energized today? 55. What made me happy to be alive today? I hope you found the questions above helpful, and that they encourage you to start keeping a gratitude journal (or give you some inspiration for the gratitude journal you’re already keeping). Live your best life by counting your daily blessings. I put together a PDF which contains the 55 gratitude questions above. Print it out and tuck it into your gratitude journal for easy reference.